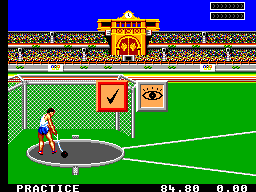 Olympic Gold is an officially licensed game for the Barcelona ’92 Olympic Games. 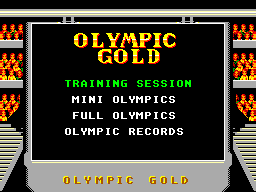 It doesn’t really have a storyline, it’s just a collection of mini games, each one a different Olympic sporting event. None of the events would survive by itself, but altogether it can make for a fun multiplayer game. My earliest memories of this game were good ones. I remember playing it at my cousins’ house and enjoying it. Ah, good times. I’ve liked the game ever since. This game also has a choice of 8 different languages. Not too shabby. The game is made up 7 different sporting events. They include the 100m Sprint, Hammer Throw, Archery, 110m Hurdles, Pole Vault, Diving, and Swimming. They all vary and require you to do something different. Some of them require just button mashing and maybe odd use the directional pad, whereas some require a steady hand and accuracy with the directional pad. In the swimming event you are given the task of pacing and not depleting your energy bar before finishing. It’s harder than it sounds believe me. Most of the events are easy to learn but some require practice, so it’s handy that there’s a ‘Training Session’ available. You can also choose between the ‘Mini Olympics’, where you select what events you want to compete in or if you’re a real man, the ‘Full Olympics’, which include all of the events. You compete against either human or computer players and you’re objective is to finish as high as you can in each event and get the highest points tally. You can also aim to beat the World Records for each of the events (I can beat all of them but the Archery, that damn Kim Soo Nyung). The graphics are great. The menus are easy to navigate and look good. The game graphics are bright and colourful. The backgrounds are great and really give you the feeling of competing in a stadium. The animation is also very good and never at any point is there any slow-down. The only thing you could say is that perhaps some of the sprites could have been bigger, but overall the graphics don’t let the game down and are probably some of the best on the SMS. There is plenty of music and sound FX in this game which make it all the more enjoyable. There’s different music for each event and they all seem so fitting. They’re upbeat and somehow psyche you up for the race. There’s a host of well done SFX too, like gun firing, diving boards, splashing into water, firing arrows. The only dodgy one would have to be the crowd cheering at the end of the race. Overall, very good. This game basically gets it gameplay from the varied controls. Each event is different and should be learned how to be done in the training sessions first. 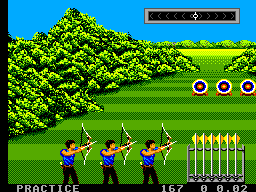 The controls are very responsive, which is good for some of the harder events such as archery and diving. The button bashing events are my favourite though; destroying your controller has never been so much fun. The only thing that bugs me is that after all these years of playing the game, I still can’t figure out how to properly do that damn pole vault. Because this game is simple to play and easily pick up-and-playable, I come back to it often. It’s also one of the first games I bring out when there’s a multiplayer session. Trying to break the records gives you some sort of target to aim for and gives the game a bit more longevity. Overall though, it’s not something you’ll be coming back to in single player. Multiplayer can be a great laugh though. This game looks good, sounds good and is fun to play. The varied events are interesting and challenging. I think it’s definitely a lot better than other similar games such as ‘Summer Games’. It’s pretty easy to pick up and play and is quite a common game to come by so if you haven’t played it, I recommend you give it a go. Definitely more fun with 4 players.